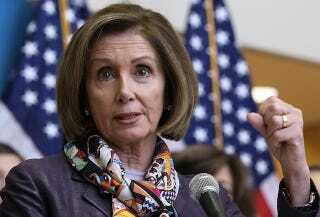 Politico, dedicated student of who's up and who's down in Washington, says Pelosi has faded. Well then! During the past election season, Rep. Nancy Pelosi (D-Calif.) could have starred in a remake of the Hollywood cult classic "Attack of the 50-Foot Woman." In an endless string of campaign ads, Republicans caricatured her - even put her image on billboards - as a political monster. But now, the former House speaker more closely resembles "The Incredible Shrinking Woman." Of course, Pelosi being demonized by Republicans does not equal actual power. The suggestion in the piece is that she's being made invisible now not because that demonization has ended, but in part because of the demonization itself. The White House is said to want none of that scary San Francisco liberal stuff — it has its own problems. The evidence of Pelosi's eclipse: She wasn't involved in the last-minute budget wrangling, giving a speech at Tufts instead. Her exclusion is seen by House Democrats as a sign that no one cares about them, which no one, not least political officials, likes, as well as ingratitude by the White House after Pelosi cracked the whip on its agenda in the last Congress. She may even vote against the budget deal to register disapproval of the White House leaving them out of the dealmaking. On the other hand, the article suggests that she's less visible because she's delegating more to junior members and tapping her fundraising power for the next election. Apparently, in Washington, sharing the spotlight and applying your resources where they'll be most effective is also a sign of weakness.